Fabrication procedures for highly magnetically responsive lanthanide ion chelating polymolecular assemblies are presented. The magnetic response is dictated by the assembly size, which is tailored by extrusion through nanopore membranes. The assemblies' magnetic alignability and temperature-induced structural changes are monitored by birefringence measurements, a complimentary technique to nuclear magnetic resonance and small angle neutron scattering. Isabettini, S., Baumgartner, M. E., Fischer, P., Windhab, E. J., Liebi, M., Kuster, S. Fabrication Procedures and Birefringence Measurements for Designing Magnetically Responsive Lanthanide Ion Chelating Phospholipid Assemblies. J. Vis. Exp. (131), e56812, doi:10.3791/56812 (2018). Bicelles are tunable disk-like polymolecular assemblies formed from a large variety of lipid mixtures. Applications range from membrane protein structural studies by nuclear magnetic resonance (NMR) to nanotechnological developments including the formation of optically active and magnetically switchable gels. Such technologies require high control of the assembly size, magnetic response and thermal resistance. Mixtures of 1,2-dimyristoyl-sn-glycero-3-phosphocholine (DMPC) and its lanthanide ion (Ln3+) chelating phospholipid conjugate, 1,2-dimyristoyl-sn-glycero-3-phospho-ethanolamine-diethylene triaminepentaacetate (DMPE-DTPA), assemble into highly magnetically responsive assemblies such as DMPC/DMPE-DTPA/Ln3+ (molar ratio 4:1:1) bicelles. Introduction of cholesterol (Chol-OH) and steroid derivatives in the bilayer results in another set of assemblies offering unique physico-chemical properties. For a given lipid composition, the magnetic alignability is proportional to the bicelle size. The complexation of Ln3+ results in unprecedented magnetic responses in terms of both magnitude and alignment direction. The thermo-reversible collapse of the disk-like structures into vesicles upon heating allows tailoring of the assemblies' dimensions by extrusion through membrane filters with defined pore sizes. The magnetically alignable bicelles are regenerated by cooling to 5 °C, resulting in assembly dimensions defined by the vesicle precursors. Herein, this fabrication procedure is explained and the magnetic alignability of the assemblies is quantified by birefringence measurements under a 5.5 T magnetic field. The birefringence signal, originating from the phospholipid bilayer, further enables monitoring of polymolecular changes occurring in the bilayer. This simple technique is complementary to NMR experiments that are commonly employed to characterize bicelles. Figure 1: Schematic overview of the possible fabrication procedures. The studied magnetically alignable Ln3+ chelating polymolecular assemblies are composed of either DMPC/DMPE-DTPA/Tm3+ (molar ratio 4:1:1) or DMPC/Chol-OH/DMPE-DTPA/Tm3+ (molar ratio 16:4:5:5). The dry lipid film is hydrated with a 50 mM phosphate buffer at a pH value of 7.4 and the total lipid concentration is 15 mM. An effective hydration of the lipid film requires either freeze thawing cycles (FT) or heating and cooling cycles (H&C). H&C cycles are necessary to regenerate samples after the last freeze thawing step, or to regenerate samples kept frozen over a prolonged period of time if they are to be used without further extrusion. These steps are extensively discussed by Isabettini et al.23 Maximally alignable polymolecular assemblies are achieved, delivering different assembly architectures based on the lipid composition. The bicelle size and magnetic alignability is tunable by extrusion (Ext) through nanopore membrane filters. The presented alignment factors Af were computed from 2D small angle neutron scattering (SANS) patterns of a DMPC/Chol-OH/DMPE-DTPA/Tm3+ (molar ratio 16:4:5:5) sample extruded through either 800, 400, 200, or 100 nm pores. SANS measurements are a complementary means of quantifying bicelle alignment that will not be covered in more detail herein.11,16 The Af ranges from -1 (parallel neutron scattering or perpendicular alignment of the bicelles with respect to the magnetic field direction) to 0 for isotropic scattering. Please click here to view a larger version of this figure. where λ is the wavelength of the laser and d is the thickness of the sample. Phospholipids are optically anisotropic and their optical axis coincides with their long molecular axes, parallel to the hydrocarbon tails.11,12 No retardation is measured if the phospholipids are randomly orientated in solution. Retardation is measured when phospholipids are aligned parallel to each other. The magnetically induced birefringence can have a positive or negative sign depending on the orientation of the molecules in the magnetic field; see Figure 2. Phospholipids aligned parallel to the x-axis will result in a negative , while those aligned along the z-axis result in a positive . No birefringence is observed when the optical axis coincides with the direction of light propagation as the phospholipid aligns parallel to the y-axis. Figure 2: Alignment of the phospholipids and corresponding sign of the magnetically induced birefringence . The sign of the measured depends on the orientation of the phospholipid in the magnetic field. Dashed lines indicate the optical axis of the molecule. The light is polarized at 45° and propagates in the y direction. The magnetic field B is in the z direction. This figure has been modified from M. Liebi.11 Please click here to view a larger version of this figure. In the case of an isotropic colloidal suspension of bicelles, the orientation induced by the arrangement of the phospholipids in the bilayer will be lost, zeroing the retardation δ. The bicelles must also align in order to orientate the optically active phospholipids in their bilayers, causing a retardation δ of the polarized light. Consequently, birefringence is a sensitive tool to quantify the magnetic alignability of polymolecular assemblies. Bicelles aligned perpendicular to the magnetic field will yield a positive , while those aligned parallel will yield a negative . The sign depends on the alignment of the setup and may be checked with a reference sample. Wash all the glassware by flushing once with ethanol stabilized chloroform (>99% chloroform) and dry with compressed air. Produce 2 distinct 10 mg/mL stock solutions of DMPC and DMPE-DTPA in ethanol-stabilized chloroform (>99% chloroform), a 10 mM stock solution of Chol-OH in ethanol-stabilized chloroform (>99% chloroform) and a 10 mM stock solution of TmCl3 in methanol. Prepare a 50 mM phosphate buffer at a pH value of 7.4 by mixing 0.121 g of sodium dihydrogen phosphate dihydrate and 0.599 g of anhydrous di-sodium hydrogen phosphate in 100 mL of ultrapure H2O. Weigh the required amounts of amphiphiles (DMPC, DMPE-DTPA, and optionally Chol-OH) and Ln3+ stock solutions in separate 3 mL glass snap-cups with a 2.5 mL glass syringe. For a 3 mL sample volume of DMPC/DMPE-DTPA/Tm3+ (molar ratio 4:1:1, total lipid concentration of 15 mM), weigh in 3.6435 g of the DMPC stock solution, 1.4731 g of the DMPE-DTPA stock solution and 0.7126 g of the TmCl3 stock solution. For a 3 mL sample volume of DMPC/Chol-OH/DMPE-DTPA/Tm3+ (molar ratio 16:4:5:5, total lipid concentration of 15 mM), weigh in 2.9148 g of the DMPC stock solution, 1.4731 g of the DMPE-DTPA stock solution, 1.0749 g of Chol-OH stock solution and 0.7126 g of the TmCl3 stock solution. CAUTION: Chloroform and methanol are toxic and volatile at room temperature. Work under a fume hood and promptly proceed with the mass measurements. Transfer the content of the snap-cups to a 25 mL round bottom flask. Flush each snap-cup into the round bottom flask with about 2.5 mL of the corresponding solvent. Remove the solvent under vacuum in a rotary evaporator at 40 °C. Set the initial pressure to 30 000 Pa until most of the solvent is removed. Reduce the pressure to 100 Pa and dry the sample under rotation for a minimum of 2 h. Obtain a uniform dry lipid film on the glass walls of the flask. Place the dry lipid film for 1 minute under a steady stream of argon to avoid lipid oxidation in air and store the sample in the freezer prior to rehydration. Add the 3 mL of phosphate buffer to the round bottom flask to reach a total lipid concentration of 15 mM. Carry out a freeze-thawing (FT) cycle by plunging the flask under rotation in liquid nitrogen until it is thoroughly frozen (the liquid nitrogen stops boiling), then heat back up to 60 °C by placing the sample for 5 min in a water bath, swirling the flask continuously to aid the melting process. Apply 30 s of vortexing before each freezing cycle when the sample is liquid to aid the hydration of the lipid film. NOTE: No lipid film should be visible on the flask walls after the second freeze thawing cycle. Repeat 1.3.2 a total of five times. Close the flask with a cap to avoid unnecessary evaporation of the phosphate buffer when the sample is hot. The protocol may be paused when the sample is frozen. Proceed to two heating and cooling (H&C) cycles to stabilize the sample coming out of the last freezing step, or keep frozen for up to two months. Heat the sample to 40 or 60 °C for DMPC/DMPE-DTPA/Tm3+ (molar ratio 4:1:1) or DMPC/Chol-OH/DMPE-DTPA/Tm3+ (molar ratio 16:4:5:5), respectively, before cooling to 5 °C at 1 °C/min. Maintain the sample 5 min at the maximum and minimum temperatures of the cycle. Now, either determine the birefringence signal of the sample in an external magnetic field (step 2) or further extrude the sample to tailor the bicelle dimensions and magnetic alignability (step 1.4). Extrusion of the polymolecular assemblies. Assemble the extruder as shown in Figure 3. Use gloves and tweezers with protecting silica tubes for handling. Wet the filter paper (5) with a few drops of buffer to allow for an optimal placement of the membrane filter (6). Make sure the paper has no folds after placing the o-ring (7) on top. NOTE: The extrusion process was tested on membrane filters (6) with a pore diameter of 800, 400, 200 and 100 nm; see Figure 7. Set the water bath to 40 °C for DMPC/DMPE-DTPA/Tm3+ (molar ratio 4:1:1) samples or 60 °C for DMPC/Chol-OH/DMPE-DTPA/Tm3+ (molar ratio 16:4:5:5) samples to guarantee the formation of extrudable vesicles. Connect the extruder to a pressurized nitrogen bottle using a high-pressure PVC tube (> 4 MPa) equipped with serto adaptors and extrude the liquid material through the membrane. 1 MPa of pressure is usually required for extrusion through membrane filters (6) with a pore diameter of 200 nm and above. 1.5-2.5 MPa are required for the smaller membrane filters (6) with a pore diameter of 100 nm. NOTE: Change the membrane filter if abnormally high pressures (>2.5 MPa) are required to extrude the sample (this is the first sign of clogging). Open the cover (10) and insert the sample using a 2 mL glass pipette. Then close the cover (10) and open the pressure valve (12) while holding the sample outlet tube (2). Close the pressure valve (12) after the extrusion cycle is completed, vent and continue with the next cycle. NOTE: Do not leave the sample in contact too long with the hot jacketed vessel (8) to avoid excessive sample loss by evaporation. 30-60 s is enough time for a 3 mL sample to equilibrate in the extruder before opening the pressure valve (12). Proceed to 10 extrusion cycles for a given membrane pore dimension as shown in Figure 3. Most of the bicelle systems are extruded 10 times through membranes with a pore diameter of 200 and another 10 times through membranes with a pore diameter of 100 nm, guaranteeing sample comparability. Now, determine the birefringence signal of the sample in an external magnetic field (step 2). Figure 3: Laboratory extruder used for bicelle and vesicle preparations. The extruder is assembled from the bottom up: (1) mount, (2) sample collecting space with a 2.4 mm (inner diameter) plastic outlet tube and o-ring, (3) and (4) large and small stabilizing mesh, (5) filter paper, (6) membrane filters, (7) o-ring, (8) jacketed vessel, (9) top cover with inlet and pressure connection, (10) cover, (11) butterfly screws, (12) pressure valve. A sketch of the assembled extruder is shown of the right-hand-side. The nitrogen gas (N2) is supplied by a pressure vessel and the jacketed vessel (9) is connected to a water bath for temperature control. The sample undergoes 10 extrusion cycles for any given membrane filter pore diameter (sample path shown in blue). Please click here to view a larger version of this figure. 2. Birefringence measurements of DMPC/DMPE-DTPA/Tm3+ (molar ratio 4:1:1) and DMPC/Chol-OH/DMPE-DTPA/Tm3+ (molar ratio 16:4:5:5) polymolecular assemblies. Build and connect the birefringence setup as presented in Figure 4 and supply power to the respective electronic elements. Do not place the PEM, the sample, and the second polarizer in the laser path at this stage. Avoid detecting back-scattered laser light by covering reflecting surfaces, for example aluminum mirror holders, with black paper. 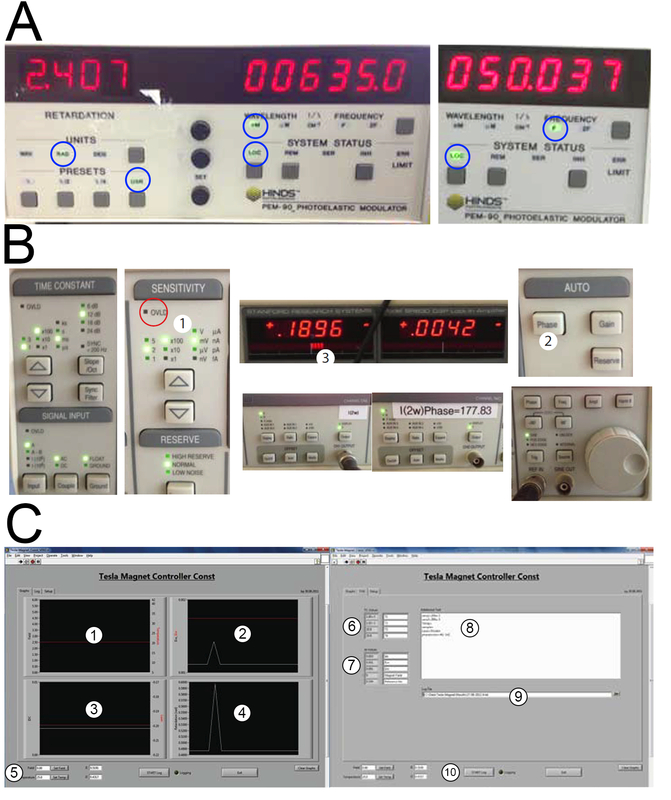 Adjust the mirrors to maximize the laser intensity at the detector, which is represented by the intensity of the direct current obtained from the low pass filter in Figure 4B. CAUTION: Wear appropriate eye protection when adjusting the mirrors and consult with a laser safety instructor if manipulating lasers for the first time. Turn the first crossed linear polarizer (maintained perpendicular to the incident laser beam) to maximize the . Figure 4: Schematic representation of the birefringence setup and connections for the optical signals. A) A superconducting electromagnet supplies a 5.5 T magnetic field. The light from a diode laser at 635 nm is polarized by two crossed polarizers. A photoelastic modulator PEM-90 operates at 50 KHz with an amplitude A0 of 2.405 rad and placed between the two polarizers. The sample lies in the magnet between the PEM and the second polarizer. Non-polarizing mirrors guide the light through the different elements and is finally detected by a photo detector. The first and second harmonic and of the AC signal are monitored, permitting the calculation of the birefringence signal giving information on the magnetic alignability of the Ln3+ chelating polymolecular assemblies. The sample cuvette is connected to an external water bath for temperature control (blue). The temperature of the sample is monitored with a temperature probe (red). B) The signal from the photo detector is fed into a second order Sallen-Key low pass filter (24 V AC power supply) with a cut-off frequency of 360 Hz through a ±12 V DC power supply braded cable (3). The low pass filter extracts the DC component and delivers it to the PC-interface (4) through a BNC 50 Ω cable. The signal from the photo detector is delivered to the two lock-in amplifiers (which extract the first and second harmonic and ) through a BNC 50 Ω cable (1) & (2). The harmonic intensities are detected by a phase-sensitive detection. Consequently, the PEM signal is used as reference signal for the lock-in amplifiers (1f-output of the PEM into the first lock-in amplifier and 2f-output into the second, connected with BNC 50 Ω cables). The output signals are delivered to the PC-interface unit through BNC 50 Ω cables. Analog acquisition units cFP-AI-110 and cFP-CB-1 digitalize the signal that is transferred to the computer through a RS 232 cable for monitoring. The type K temperature probe is also connected to the PC-interface unit where analog acquisition units cFP-CB-3 and cFP-TC-120 digitalize the signal before transferring it to the computer through a RS 232 cable for monitoring. C) Picture of the schematic setup presented in B. Key elements are identified with corresponding numbers from 1 to 4. Please click here to view a larger version of this figure. Place the second crossed linear polarizer perpendicular to the incident laser beam, as shown in Figure 4A. Minimize the by setting the second polarizer at a 90° angle with respect to the first. Place the photoelastic modulator (PEM) at 0° between the two crossed linear polarizers and perpendicular to the incident laser beam as shown in Figure 4A. Adjust the PEM to a frequency of 50 kHz and amplitude A0 to 2.405 rad as shown in Figure 5A. This makes the DC component independent of birefringence and boosts the . NOTE: The optical axis of the PEM may be tuned by a few degrees to maintain a constant in air before measuring any sample. Wait for 1 h after turning on the laser and electronic equipment to stabilize the signal. The signal is stable once the auto-phasing of the lock-in amplifiers remains constant. Place the sample in a temperature controlled quartz cuvette with a path-length of 10 mm and connect it to an external water bath initially set at 5 °C. Place a 0.5 mm thick type K thermocouple (temperature probe) directly in the sample to monitor the temperature of the sample. Verify that the probe does not interfere with the laser light by placing a white paper in the laser path (after the cuvette) and looking for shadows caused by the probe. NOTE: There is a 2-3 °C difference between the temperature recording of the water bath and the temperature of the sample. Place the cuvette in the bore of the magnet, as shown in Figure 4A. The laser light propagates horizontally through the sample, is deflected by non-polarizing mirrors and detected by a photo detector. NOTE: The laser is directed down, through the sample, and back up the same path to account for Faraday effects (i.e. the rotation of the polarization plane of light caused by the magnetic field when going down is canceled when coming back out in the opposite direction). Apply a steady air flow of compressed air at room temperature and 10000 Pa on the cuvette to avoid condensation of water on the cell walls, which would reduce the intensity of the signal and increase noise. This is especially important when measuring at 5 °C. Detect the first and second harmonic and of the AC signal with two lock-in amplifiers. Auto phase the lock-in amplifiers by pressing the button (2) shown in Figure 5B and adjust the sensitivity as shown in Figure 5B (1). Make sure there are not more than four red bars on the amplifiers as shown in Figure 5B (3) to avoid signal overload. Note down the employed sensitivity for both lock-in amplifiers in the program Tesla_Magnet_Const_V092 as shown in Figure 5C (8). The program is provided as supplementary information. Ramp the magnetic field up to 5.5 T by supplying current to the magnet through the program Tesla_Magnet_Const_V092 as shown in Figure 5C (5). where and are Bessel functions of the first kind, with and .11,13,18,33,34 Plot the retardation in the program Tesla_Magnet_Const_V092, as shown in Figure 5C (4). NOTE: The retardation provided by the program should not be used to calculate the birefringence signal if the two lock-in amplifiers are not operating at the same sensitivity (see step 2.12). The logged harmonic intensities and have to be multiplied by the sensitivity of the lock-in amplifiers to get the correct dimensions. Moreover, the birefringence signal measured under a magnet field must be normalized by subtracting the mean birefringence signal obtained at 0 T.
Monitor the sample's birefringence signal at constant or changing temperature (1 °C/min) by regulating the temperature of the water bath connected to the cuvette shown in Figure 4. Log the experimental data by filling in the experimental description in Figure 5C (8), providing a file name in (9), and pressing the "START log" button (10). Figure 5: Illustrations of the employed settings and program screenshots. A) PEM settings: retardation 2.405 rad, wavelength 635 nm, frequency 50 Hz. White circles indicate what settings to be activated (USR = user defined retardation, LOC = local mode of operation). B) Lock-in amplifier settings. The sensitivity (1) has to be selected before each measurement as required in step 2.11. There should not be more than four red bars on the display (3) to avoid a signal overload. An overload occurs when the red led in (1) turns on, making a measurement impossible. Press the auto phase button (2) before every measurement. C) Screenshots of the program Tesla_Magnet_Const_V092 provided as supplementary information. The program allows control of the magnetic field and recording of all the signal outputs as a function of time. The magnetic field strength and sample temperature are plotted in (1). The first and second harmonic and of the AC signal measured by the two lock-in amplifiers are plotted in (2). The intensity of the direct current is plotted in (3). The retardation is calculated as described in step 2.13 and plotted in (4). The magnetic field strength is set in (5). The direct measurement of the temperature recorded by the Type K thermocouple is presented in (6) and the output signals ( and ) in (7). Additional sample information may be inserted in (8) such as the employed sensitivity of the amplifiers, sample name, etc. The data may be logged and exported to a .txt file provided in (9). Start and stop the data acquisition with the "START log" button (10). Please click here to view a larger version of this figure. The birefringence signal of a non-extruded DMPC/DMPE-DTPA/Tm3+ (molar ratio 4:1:1) sample was monitored under a 5.5 T magnetic field during a heating and cooling cycle from 5 to 40 °C and back at a rate of 1 °C/min (Figure 6). The birefringence results confirmed high magnetic alignments at 5 °C with a value of 1.5 x 10-5, twice as strong as for the reported extruded systems.6,7,23 The zeroing of the birefringence signal above the Tm of DMPC at 24 °C was caused by the formation of non-alignable vesicles. The movement appearance of the liquid disordered phase triggered major rearrangements in the polymolecular assemblies. These rearrangements are thermo-reversible. Alignable species were regenerated upon cooling below Tm and the birefringence signal followed the same trend as on heating. The distinct peaks occurring around Tm mark the replacement of the alignable assemblies by non-alignable vesicles.23 The slow kinetics of the molecular rearrangements with respect to the applied heating and cooling rate of 1 °C/min explain why the peaks were not overlapping. Instead, both peaks started at the Tm of DMPC, suggesting that the bilayer lipids must have a certain degree of order to favor the formation of alignable species. Figure 6: Birefringence signal as a function of temperature for a non-extruded DMPC/DMPE-DTPA/Tm3+ (molar ratio 4:1:1) sample upon heating (red) and cooling (blue) at 1 °C/min. The sample was prepared following the protocol steps 1 to 1.3.5. The birefringence measurements were conducted following the protocol step 2. The magnetic field strength was ramped up to 5.5 T and the sample was maintained at 5°, achieving a birefringence signal of 1.5 x 10-5 before proceeding to the heating and cooling cycle. The birefringence signal flatlines at temperatures above 35 °C where no alignment was observed as the sample was solely composed of vesicles. Upon cooling, the bicelles were regenerated and a final birefringence signal of 7.2 x 10-6 was achieved at 5.5 T and 5 °C. The magnetic field strength was ramped down to 0 T and the sample was maintained at 5 °C. Please click here to view a larger version of this figure. A DMPC/Chol-OH/DMPE-DTPA/Tm3+ (molar ratio 16:4:5:5) sample was hydrated following the heating and cooling procedure in step 1.3.4 and subsequently extruded 10 times at 60 °C through membrane filters of different pore sizes, see step 1.4. At 60 °C, the lipid mixture assembles into vesicles, which are shaped by the extrusion process.16,35,36,37 After completing the extrusion, the bicelles were regenerated by cooling to 5 °C and the hydrodynamic diameter DH was measured by DLS. The magnetic alignability of the bicelles was evaluated at 5 °C by computing the Af with SANS at 8 T and by measuring the birefringence signal at 5.5 T; see Figure 7. The birefringence signal was obtained by ramping the field up to 5.5 T and back down to 0 T as shown in Figure 7A. The peak birefringence occurred at 5.5 T where the highest degree of alignment was expected according to equation 1. The hydrodynamic diameter DH of the bicelles was reduced to 220, 190, 106, and 91 nm by successive extrusions through membranes with pore sizes of 800, 400, 200, and 100 nm respectively. The corresponding decrease in magnetic alignment was confirmed by the decreasing birefringence signal and the reduction in absolute Af as it approached zero in Figure 7B. The results confirmed the possibility of controlling bicelle size and magnetic alignment through tailoring of the vesicles by extrusion at 60 °C and cooling back to 5 °C. Figure 7: Magnetic alignment of a DMPC/Chol-OH/DMPE-DTPA/Tm3+ (molar ratio 16:4:5:5) sample extruded through membrane filters of various pore dimensions. A) Birefringence signal Δn′ as a function of the magnetic field strength B when ramping up and down for the sample extruded through 800 nm pores. The peak birefringence was reached at 5.5 T in accordance with equation 1. This maximal birefringence value is reported in B). The same sample was extruded through 400 nm pores. The magnetic alignment was evaluated by both birefringence measurements (black squares) at 5.5 T (analogously to what was done for the previous extrusion step in A) and by computation of alignment factors Af (red circles) at 8 T plotted as a function of the hydrodynamic diameter DH obtained by DLS. The magnetic alignment was evaluated analogously on the same sample extruded through 200 nm pores, and one last time after extruding through 100 nm pores. All measurements were performed at 5 °C. Please click here to view a larger version of this figure. A detailed account of how birefringence measurements were used in combination with SANS experiments to evaluate methods for generating highly magnetically responsive Ln3+ chelating phospholipids assemblies is in Isabettini et al.23 The proposed fabrication protocols are also applicable for assemblies composed of the longer DPPC and DPPE-DTPA phospholipids or for those containing chemically engineered steroid derivatives in their bilayer.11,12,17,18,19 The only requirement being that the sample is heated to sufficiently high temperatures in steps 1.3.2, 1.3.3, 1.3.4 and 1.4.2. The temperatures must allow the bilayer lipids to enter a liquid disordered phase, guarantying optimal hydration of the dry lipid film or sample regeneration. 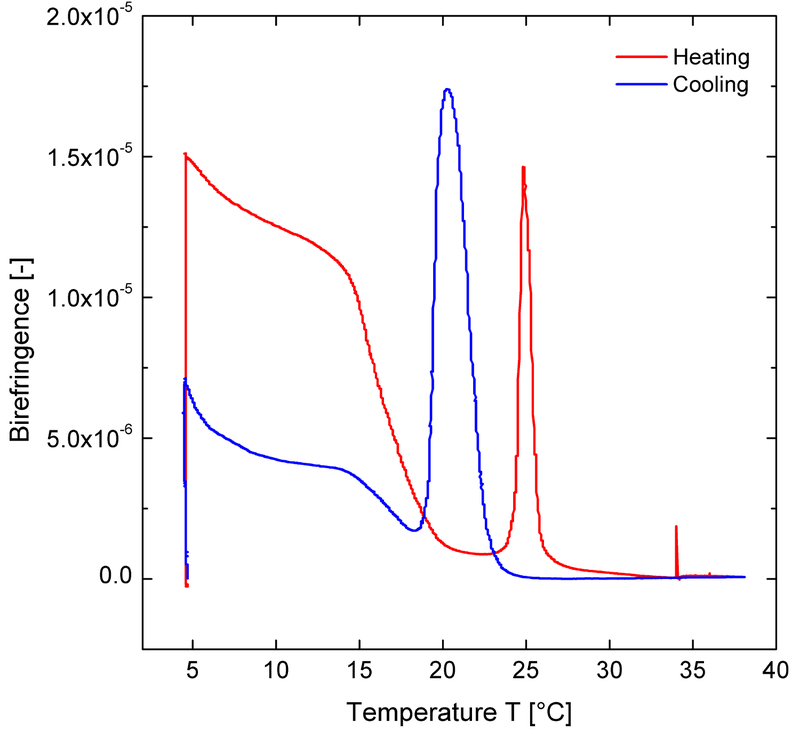 DPPC/DPPE-DTPA/Tm3+ (molar ratio 4:1:1) assemblies, for example, need to be heated above the phase transition temperature of DPPC at 42 °C, while the analogous DMPC-based system must be heated above 24 °C. A sufficiently high temperature is also necessary to guarantee the formation of extrudable vesicles occurring when the lipid bilayer is in a disordered state in step 1.4. The freeze-thawing cycles in step 1.3.2 may be fully replaced by H&C cycles.23 However, the sample needs more time to fully hydrate the lipid film with this procedure and must be vortexed 20 min when at 5 °C and 2 min when at 60 °C. Additional H&C cycles are undertaken if elements of the dry lipid film are still observed on the glass walls of the flask. Every sample is optically different depending on the nature of the constituting lipids employed. Monitoring the sample's turbidity as a function of temperature is a complementary method to evaluate temperature-induced structural transformations in the assemblies. Although these measurements are usually conducted in the absence of a magnetic field in a spectrophotometer, monitoring the intensity of the laser's direct current with the setup proposed herein offers the same information in the presence of a magnetic field.11,16 The DMPC/DMPE-DTPA/Tm3+ (molar ratio 4:1:1) samples are usually less turbid than their Chol-OH containing DMPC/Chol-OH/DMPE-DTPA/Tm3+ (molar ratio 16:4:5:5) counterparts at 5 °C. Samples resembling water at 5 °C are generally not alignable in a magnetic field. At room temperature, both samples look transparent because the DMPC/DMPE-DTPA/Tm3+ (molar ratio 4:1:1) samples are in a transition phase between bicelles and vesicles and large concentric holes appear in the DMPC/Chol-OH/DMPE-DTPA/Tm3+ (molar ratio 16:4:5:5) bicelles.11,16,23 The transition state of bicelles to vesicles in DMPC/DMPE-DTPA/Tm3+ (molar ratio 4:1:1) is also accompanied with an increase in the sample's viscosity at room temperature. This temperature-dependent change in turbidity makes choosing the right sensitivity in step 2.11 difficult. If the sensitivity is adjusted too high on a turbid sample at 5 °C, the more transparent nature of the sample on heating may cause an overload of the amplifiers. Moreover, highly turbid samples will considerably increase the noise to signal ratio and may not be suitable for birefringence measurements. The laser light must be able to go through the sample in order to be detected. Non-extruded samples are always more turbid and have the tendency to aggregate upon short term storage in the fridge. Nevertheless, the magnetically responsive samples are readily regenerated with a H&C cycle. Non-extruded samples may also be stored in the frozen state and readily regenerated by H&C cycles. Extruded samples are kept in the fridge and commonly measured in one week following the sample's preparation. No studies report on the prolonged storage of extruded species in either a liquid or a frozen state. Therefore, the size distribution of the assemblies obtained from extrusion cannot be guaranteed over prolonged storage. Analogously to any bicelle system, these magnetically alignable planar assemblies only exist in a defined range of lipid composition and concentration. Altering the lipid ratios will result in different assembly architectures, including the formation of micelles, ribbons, and vesicles.5,11,16,18,20 The phosphate buffer concentration and pH in step 1.1.3 plays a crucial role in shaping the bicelles and their magnetic response. The buffer defines the physico-chemical interactions governing the hydrophilic environment surrounding the polymolecular assemblies. Lower buffer concentrations result in different assembly architectures, whilst higher concentrations cause sample aggregation and precipitation due to an excess charge screening. Under acidic conditions with pH values between 3 and 4, the carboxylic acid moieties serving as ligands in the DMPE-DTPA/Ln3+ complex are protonated. This results in the destruction of the magnetically responsive polymolecular assemblies, observed by aggregation and precipitation in the sample. The magnetically responsive Ln3+ polymolecular assemblies have a reasonable resistance towards more basic pH values. However, DMPC/DMPE-DTPA/Tm3+ (molar ratio 4:1:1) bicelles were shown to break up into micelles at pH values of 12.9.11 The samples must never be exposed to tap water or other salts. Any other ion will disturb the Ln3+ chelating process or result in aggregation of the assemblies due to charge screening. For SANS measurements, the buffer is prepared as described in step 1.1.3 in D2O instead of ultrapure H2O. Note that the pH meter reading will be 7.0 (corresponding to a pD value of 7.4). The structural transformations occurring in polymolecular assemblies subject to a heating and cooling cycle are thermo-reversible. Therefore, the final birefringence signal at 5 °C should be the same as before the temperature cycle.11,16 If the birefringence signal is higher after the cycle, the sample was not properly regenerated in step 1.3.4. This commonly occurs in samples stored for a prolonged period of time. A lower birefringence signal after the temperature cycle as observed in Figure 6 indicates a problem in the experimental setup. Most commonly, the laser light path was disturbed by back scattering or another object. This is especially problematic with the temperature probe inserted directly into the sample (see step 2.8) which should be placed as to not interfere with the direct path of the laser light. A disturbed light path causes a fall in the , a noisy signal, and/or abnormal peaks in the birefringence-temperature curves. For example, the peak occurring on heating at about 35 °C in Figure 6 was caused by expansion of the water-cooling tubes into the direct path of the laser light. The birefringence signal may not be trusted from that point onwards. Although the general shape of the cooling curve was normal, the lower birefringence signal obtained at 5 °C was caused by the interference. The birefringence signal originating from changes in the sample's magnetic alignment may be decoupled from the signal caused by molecular rearrangements in the bilayer. Alignment factors computed from anisotropic 2D SANS patterns obtained under a magnetic field are only influenced by the bulk alignment of the polymolecular assemblies. The two methods are complementary and allow decoupling of the contributions to the birefringence signal. The proposed birefringence setup could be perfected by splitting the laser beam, allowing for the simultaneous monitoring of samples with and without exposure to the external magnetic field. The birefringence results obtained for the sample in the magnetic field could be normalized by the signal obtained for the sample at 0 T, effectively accounting for the background. The authors acknowledge the Swiss National Science Foundation for financing SMhardBi (project number 200021_150088/1). The SANS experiments were performed at the Swiss spallation neutron source SINQ, Paul Scherrer Instute, Villigen, Switzerland. The authors warmly thank Dr. Joachim Kohlbrecher for his guidance with the SANS experiments. The birefringence measurement setup under high magnetic fields was inspired from the existing setup at the high-field magnetic laboratory HFML, Nijmegen, The Netherlands. We thank Bruno Pfister for his help in developing the electronics of the birefringence setup, Jan Corsano and Daniel Kiechl for constructing the frameworks permitting fine and facile alignment of the laser, and Dr. Bernhard Koller for ongoing technical support. Sanders, C. R., Hare, B. J., Howard, K. P., Prestegard, J. H. Magnetically-oriented phospholipid micelles as a tool for the study of membrane-associated molecules. Prog. Nucl. Magn. Reson. Spectrosc. 26, 421-444 (1994). Glover, K. J., et al. Structural evaluation of phospholipid bicelles for solution-state studies of membrane-associated biomolecules. Biophys. J. 81, (4), 2163-2171 (2001). Katsaras, J. H. T. A., Pencer, J., Nieh, M. -P. "Bicellar" lipid mixtures as used in biochemical and biophysical studies. Naturwissenschaften. 92, (8), 355-366 (2005). Sanders, C. R., Prosser, R. S. Bicelles: a model membrane system for all seasons? Structure. 6, (10), 1227-1234 (1998). Dürr, U. H. N., Soong, R., Ramamoorthy, A. When detergent meets bilayer: birth and coming of age of lipid bicelles. Prog. Nucl. Magn. Reson. Spectrosc. 69, 1-22 (2013). Dürr, U. H. N., Gildenberg, M., Ramamoorthy, A. The magic of bicelles lights up membrane protein structure. Chem. Rev. 112, 6054-6074 (2012). Ujwal, R., Abramson, J. High-throughput crystallization of membrane proteins using the lepidic bicelle method. J. Vis. Exp. (59), (2012). Barbosa-Barros, L., et al. Bicelles: lipid nanostructured platforms with potential dermal applications. Small. 6, 807-818 (2012). Lin, L., et al. Hybrid bicelles as a pH-sensitive nanocarrier for hydrophobic drug delivery. RSC Adv. 6, 79811-79821 (2016). Beck, P., et al. Novel type of bicellar disks from a mixture of DMPC and DMPE-DTPA with complexed lanthanides. Langmuir. 26, (8), 5382-5387 (2010). Liebi, M. Tailored phospholipid bicelles to generate magnetically switchable material. ETH Zürich. Switzerland. PhD Thesis n° 21048, ISBN 978-3-905609-55-4 (2013). Liebi, M., et al. Magnetically enhanced bicelles delivering switchable anisotropy in optical gels. ACS. Appl. Mater. Interfaces. 6, (2), 1100-1105 (2014). Liebi, M., et al. Alignment of bicelles studied with high-field magnetic birefringence and small-angle neutron scattering measurements. Langmuir. 29, 3467-3473 (2013). Prosser, R. S., Hwang, J. S., Vold, R. R. Magnetically aligned phospholipid bilayers with positive ordering: a new model membrane system. Biophys J. 74, 2405-2418 (1998). Prosser, R. S., Bryant, H., Bryant, R. G., Vold, R. R. Lanthanide chelates as bilayer alignment tools in NMR studies of membrane-associated peptides. J. Magn. Reson. 141, 256-260 (1999). Liebi, M., Kohlbrecher, J., Ishikawa, T., Fischer, P., Walde, P., Windhab, E. J. Cholesterol increases the magnetic aligning of bicellar disks from an aqueous mixture of DMPC and DMPE-DTPA with complexed thulium ions. Langmuir. 28, (29), 10905-10915 (2012). Liebi, M., et al. Cholesterol-diethylenetriaminepentaacetate complexed with thulium ions integrated into bicelles to increase their magnetic alignability. J. Phys. Chem. B. 117, (47), 14743-14748 (2013). Isabettini, S., et al. Tailoring bicelle morphology and thermal stability with lanthanide-chelating cholesterol conjugates. Langmuir. 32, 9005-9014 (2016). Isabettini, S., et al. Mastering the magnetic susceptibility of magnetically responsive bicelles with 3β-Amino-5-Cholestene and complexed lanthanide ions. Phys. Chem. Chem. Phys. 19, 10820-10824 (2017). De Angelis, A. A., Opella, S. J. Bicelle samples for solid-state NMR of membrane proteins. Nat. Protoc. 2, (10), 2332-2338 (2007). Son, W. S., et al. "Q-Titration" of long-chain and short-chain lipids differentiates between structured and mobile residues of membrane proteins studied in bicelles by solution NMR spectroscopy. J. Magn. Reson. 214, 111-118 (2012). Avanti Polar Lipids Inc. Bicelle Preparation. Available from: https://avantilipids.com/tech-support/liposome-preparation/bicelle-preparation (2017). Isabettini, S., et al. Methods for Generating Highly Magnetically Responsive Lanthanide-Chelating Phospholipid Polymolecular Assemblies. Langmuir. 33, 6363-6371 (2017). Nieh, M. -P., Glinka, C. J., Krueger, S., Prosser, R. S., Katsaras, J. SANS study on the effect of lanthanide ions and charged lipids on the morphology of phospholipid mixtures. Biophysical Journal. 82, (5), 2487-2498 (2002). Watts, A., Spooner, P. J. R. Phospholipid phase transitions as revealed by NMR. Chem. Phys. Lip. 57, 195-211 (1991). Bleaney, B. Nuclear magnetic-resonance shifts in solution due to lanthanide ions. J. Magn. Reson. 8, 91-100 (1972). Prosser, R. S., Volkov, V. B., Shiyanovskaya, I. V. Solid-state NMR studies of magnetically aligned phospholipid membranes: taming lanthanides for membrane protein studies. Biochem. Cell Biol. 76, 443-451 (1998). Prosser, R. S., Volkov, V. B., Shiyanovskaya, I. V. Novel chelate-induced magnetic alignment of biological membranes. Biophys. J. 75, 2163-2169 (1998). Shklyarevskiy, I. O., et al. Magnetic alignment of self-assembled anthracene organogel fibers. Langmuir. 21, 2108-2112 (2005). Christianen, P. C. M., Shklyarevskiy, I. O., Boamfa, M. I., Maan, J. C. Alignment of molecular materials in high magnetic fields. Physica B: Condens. Matter. 346, 255-261 (2004). Maret, G., Dransfeld, K. Biomolecules and polymers in high steady magnetic fields. Top. App. Phys. 57, 143-204 (1985). Gielen, J. C., Shklyarevskiy, I. O., Schenning, A. P. H. J., Christianen, P. C. M., Maan, J. C. Using magnetic birefringence to determine the molecular arrangement of supramolecular nanostructures. Sci. Tech. Adv. Mater. 10, (1), 014601 (2009). Shklyarevskiy, I. O. Deformation and ordering of molecular assemblies in high magnetic fields. Nijmegen University. The Netherlands. PhD Thesis, ISBN 90-9018956-4 (2005). Fuller, G. G. Optical rheometry of complex fluids. Oxford University Press. NY. (1995). Walde, P., Cosentino, K., Engel, H., Stano, P. Giant vesicles: preparations and applications. ChemBioChem. 11, 848-865 (2010). Avanti Polar Lipids Inc. Liposome Preparation. Available from: https://avantilipids.com/tech-support/liposome-preparation (2017). Avanti Polar Lipids Inc. Preparing Large, Unilamellar Vesicles by Extrusion (LUVET). Available from: https://avantilipids.com/tech-support/liposome-preparation/luvet (2017). Isabettini, S., et al. Molecular engineering of lanthanide ion chelating phospholipids generating assemblies with a switched magnetic susceptibility. Phys. Chem. Chem. Phys. 19, 20991-21002 (2017). Battaglia, M. R., Ritchie, G. L. D. Molecular magnetic anisotropies from the Cotton-Mouton effect. J. Chem. Soc., Faraday Trans. 2. 73, (2), 209-221 (1977). Sprunt, S., Nounesis, G., Litster, J. D., Ratna, B., Shashidhar, R. High-field magnetic birefringence study of the phase behavior of concentrated solutions of phospholipid tubules. Phys. Rev. E. 48, (1), 328-339 (1993). Zhao, J., et al. Continuous paranematic ordering of rigid and semiflexible amyloid-Fe3O4 hybrid fibrils in an external magnetic field. Biomacromolecules. 17, (8), 2555-2561 (2016).